The Agricultural Economics Department at Purdue University recently released its annual outlook report that contained 12 specific articles looking at various aspects of the U.S. agricultural economy. 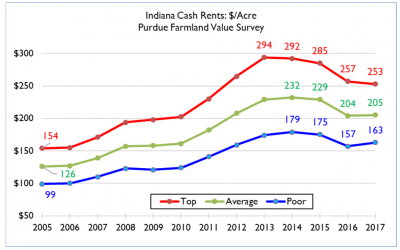 This post highlights key points from the Purdue report relating to cash rents, farmland values, and the price outlook for corn and soybeans. Professor Craig Dobbins indicated that, “In order to maintain a viable business, operators have been working to reduce the per bushel cost of production. Reducing cash rents and other crop production cost is often a slow process. The outlook for crop costs and returns indicates operators have been working to lower per bushel production cost since 2013. In 2013, the variable cost per bushel of corn on average quality farmland was $2.83. The projection of for 2018 indicates the variable cost per bushel has declined to $2.39 per bushel. This is about a 16% reduction. “Purdue Agricultural Economics Report.” Agricultural Economics Department- Purdue University (December 2017). Dr. Dobbins noted that, “Given the economic pressures at this time, 2018 cash rent is expected to be lower. Periods of declining cash rent are historically rare. The better than expected yields for many producers in 2017 will provide support for stable cash rents, but continued low crop prices indicate producers need to continue all efforts to reduce costs. 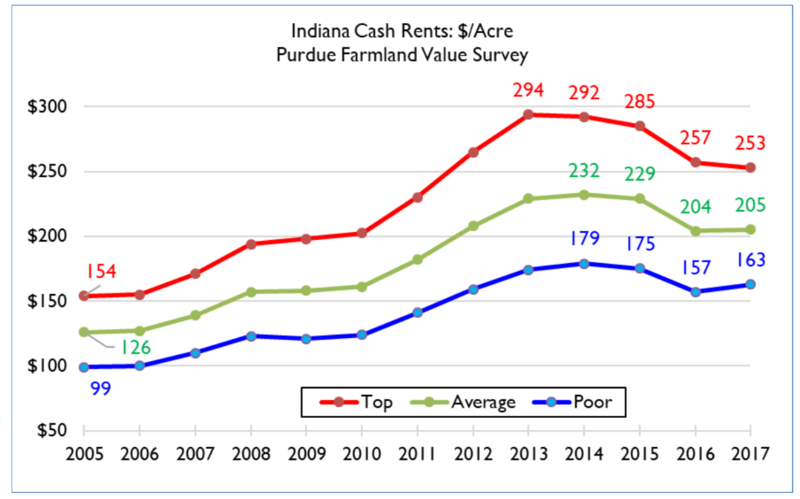 Anticipated cash rents in 2018 will be 3% to 6% lower than in 2017. Looking ahead, the Purdue outlook indicated that, “Some state surveys are finding small increases in farmland values [e.g., Iowa], perhaps indicating the downward adjustment is slowing or even ending. 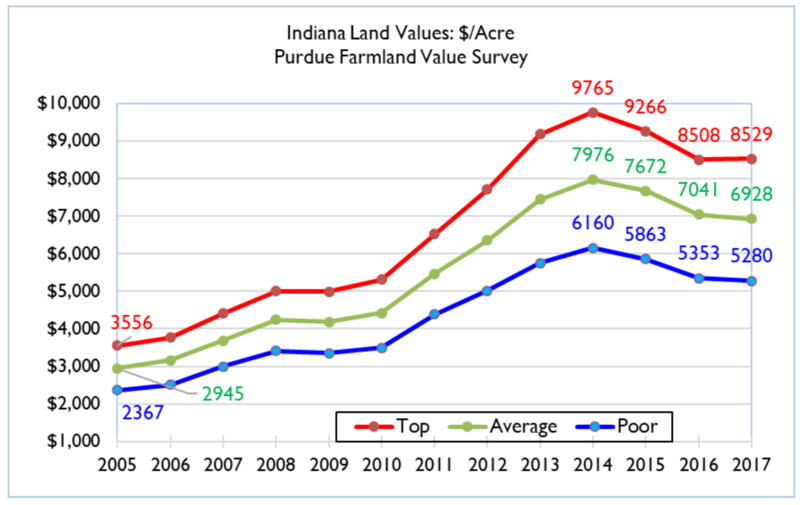 The 2017 Purdue Land Value Survey indicated a bit of stabilization in farmland values but there were still significant reductions in areas of the state. The continued tight margins in crop farming combined with slowly rising long-term interest rates is expected to favor a continuation of the downward price movement. 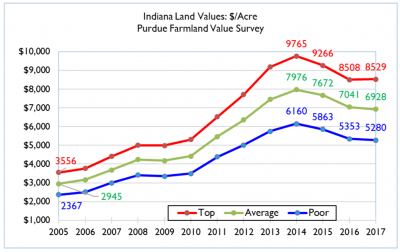 For 2018, it seems Indiana farmland values are likely to decline another 5% to 10% from 2017 levels. U.S. Corn Acreage and Yield. USDA- Economic Research Service (November 15, 2017). 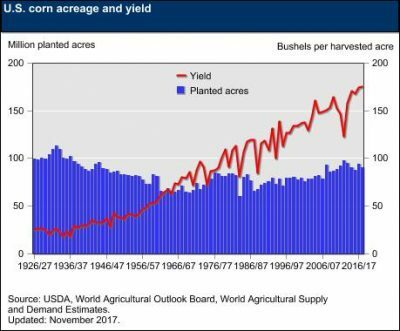 “Even though corn acreage was down in 2017, the record yields mean that the U.S. produced more corn than will be consumed with ending stocks rising to near 2.4 billion bushels. Unfortunately, ending stocks for the 2017/18 marketing year will rise for the fifth consecutive year. As a result, marketing year average prices are expected to be the lowest in 11 years dating back to the 2006 crop.